Currently the fastest growing segment of the ski industry telemark skiing is fundamentally the same as alpine skiing. Both depend on balance, rotation and edging. Most people who learn to telemark have alpine skied before, but it is not a necessity. The progression to learn how to slide, balance, rotate and tilt the skis is the same in both sports. Two styles of telemarking have evolved as the sport has gained popularity. The classic style involves deep knee drops through the turn and is often what we think of if we know what telemark skiing is. Much like skiing on straight alpine skis, this method makes the sport harder than it has to be. The deep drop requires major muscle strength and prevents minor movements that enable us to get off the edge early in the turn initiation, thus making us fight the skis rather than allowing them to do the work. Modern style utilizes the sweet spot of the foot—the point at the metatarsals where we are most balanced, as opposed to the toes. Because we are closer to standing, we can utilize proper hip rotation, hips pointed down the hill, and body movement, the body extends down the hill, to make the skis switch edges and move into the fall line seemingly by themselves. The best part of telemarking, aside from the backcountry accessibility it provides, is that it improves your alpine skiing and any other snow sport that requires balance. Because telemark boots have a joint they do not support like alpine boots, thus if your balance is off, you wobble or fall. However, once you get your balance, you’re set. Start with alpine parallel turns to get used to the skis. Remember your turn shape, pointing your skis first 45º to downhill, then down the hill in the fall-line (line that a snowball would roll if pushed down the hill), then across the hill and back up at 45º. Many of us forgo the last part thinking we’ll go faster, but finishing the turns provides power for the next turn, and allows you to control your speed without skidding. 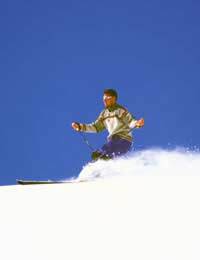 Once you are used to alpine turns on the skis, try applying the tele-position while traversing. Remember not to go as far as your toes, but to balance on your metatarsals and the top of your arch. See if you can lift your downhill ski. In telemarking, our goal is to have our weight balanced 50/50 on each ski. At the end of a traverse point your skis up-hill to stop. Are you still in an evenly balanced tele-position? If you had to stand up at the end, you’re not balanced. The nature of tele-turns naturally puts our hips facing uphill. Pretend your hips are like headlights, twist them to face where you want to go. Practice traversing and stopping until you feel comfortably balanced in tele-position and can keep your hips pointed downhill. When you are ready to link your turns, start by extending your whole body from the hips down the hill. Focus on keeping your heels down while in the fall line, balancing on your whole foot, and then return to tele-position to finish the turn. Have patience. Give your skis time in the fall line and at the turn initiation and finish. The beauty of telemark skiing is in the grace, and grace is never rushed. Besides rushing doesn’t allow you to go faster or stop without falling. Drills help you practice skills to improve your turns. Shuffle turns—shuffle your feet back and fourth all the way through the turn. Link the turns, be patient and exaggerate each part of the turn. Hop turns—instead of turning your skis into the fall line, hop them from one tele-position to the other, link the turns with the hops. Monomark turns—alternate one tele-turn then one alpine turn keeping your tips in the same position the whole time. Do five monomark turns, then five alpine turns, then five monomark turns, then five telemark turns. Balance is the key to all skiing, take your time and finish your turns. Utilize the power of spring-loaded hips; keep them pointed where you want to go, and extend your whole body down the hill. Enjoy the grace and beauty of your turns and the in and out-of-bounds places you can go.